Oh Monday, a day for cleansing after a food and drink-filled weekend. For many of you, I am sure there was Mexican cuisine, tequila and Corona involved in the weekend. 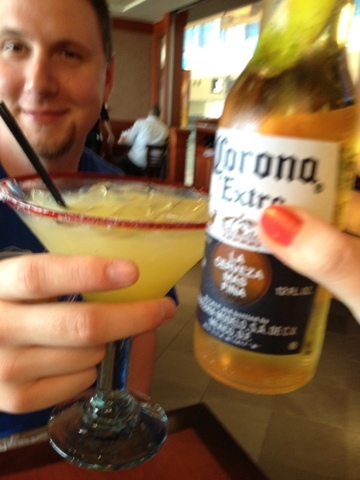 Unfortunately for Ryan and I, we spent most of Cinco de Mayo in the Detroit airport. At least we managed to have a little fun still. Since I wasn't home during the weekend, I don't have a Cinco de Mayo recipe to share with you, but I do want to share one of my favorite spices. Blackening rub is one of the spice blends that I like to make myself instead of buying so I can control the level of salt and spice. The rub stores well in an airtight container in the pantry for up to 6 months. I use this for meat, pasta sauce, soup, toast, roasting vegetables, making croutons and the list goes on. I also used the rub to make my Blackened Shrimp Tacos in an earlier post. Tonight, I used the rub to blacken three grain tempeh slices for topping a dinner salad. After raiding the produce section at the grocery store, and several loads of laundry, Ryan and I sat down to watch some of our favorite recorded shows with a healthy catch-all salad. Other ingredients in this salad include mixed greens, spinach, romaine, cabbage, red bell peppers, roasted sweet potatoes, pea sprouts, mushrooms, shredded swiss cheese and carrots. I topped it off with my homemade ranch dressing! Mix all the spices together in a small bowl and store in an air tight container in the pantry. I love this mixture but due to limited space I make a smaller batch. So I am passing on to others. 1 T onion powder, dried oregano, dried thyme, sea salt. Thanks for sharing Mom! This is a great point, the recipe can easily be halved, doubled, or any fraction.